While some may think of a tattooed and bearded guy in cargo shorts when they hear “craft beer,” women were the original home brewers. In civilizations from ancient Egypt to Middle Ages Europe, women made beer for their families and sold the excess. Now, about 29% of brewery workers are women. And they make some damn fine local favorites. We sat down with Barley Mow Brewing Company’s Ashley Smith to learn more about her journey from craft beer fan to head brewer. I grew up in Wisconsin, but moved to Jackson Hole Wyoming when I was 19. The culture in that town is outdoorsy, athletic and local to the max! There’s a brewery there called Snake River Brewing Co., and by the time I could legally drink, I would go there or another favorite, Thai Me Up Restaurant and Brewing. I was pretty much a fixture there. 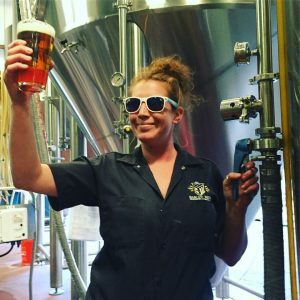 What has your experience been like in the brewing industry as a female brewer? It’s been mostly a non-issue for me. Most of the time when people find out I’m the brewer it’s met with curiosity, or even comments of encouragement. ‘You go girl’ and stuff like that. It takes a certain type of personality to work in the beer industry, and I don’t feel like that personality has anything to do with gender. What was your journey to Mow? The very first brewery I worked for was this tiny little brewery 20 minutes outside of Salt Lake City, but if you ever go to that town you might feel like you’re on the moon. Surrounded by the Children of the Corn …. Needless to say, I only lasted there about 3 months. I truly feel I cut my teeth in the industry at Uinta brewing co, in Salt Lake City. I started in packaging and just worked my way up. I was very lucky there to be able to get my hands on a lot of different areas of the company, such as picking up lab duties as needed. We then found ourselves moving to the Tampa area, and thanks to the great women’s brewing group, Pink Boots Society, I was able to find and secure employment at Cigar City prior to our move, where I worked as a brewer, up until moving on to Barley Mow. How can we change the perceived stereotype of craft beer drinkers and brewers? I honestly think it’s changing itself. We are seeing more and more women enter the industry, and I’m noticing more women in tasting rooms and pubs. We’ve seen beer that is marketed specifically to women, and they tend to flop. I don’t think most women want a 2% beer that tastes like bubblegum. I think with the plethora of styles we see on the market, that there is something for everyone. Speaking of styles, your profile says Barley Mow’s Quackalope is your favorite? Are you an IPA fan, in general? I like it all really. My go-to-beer really depends on so much. Is it hot out? Check yes, every time, for that one! Am I out, and need to drive? Am I home and done for the day? I really love double IPAs, to be honest. I like the maltier balance that they tend to have, but they are not really a practical go-to (for me) in the heat or when I have to drive, so they stay my special little treat at home. What other local beers do you love? Arkane’s Frickelsnitz, and anything that came out of a foeder from Green Bench. As the head brewer at Barley Mow, you’re responsible for preserving the quality and consistency of their brews. What’s it like brewing a brand’s recipes, as opposed to your own in home brewing? Size matters. At home, if you don’t have the right ingredient, then you either wait to brew, experiment with what you have, or run quick to the homebrew supply shop. When you’re making 930 or 1860 gallons of beer at a pop, those are not options. It takes planning, and lots of note taking. I very frequently have multiple brew sheets in front of me from previous batches, comparing critical points in my brew day. It really is all about consistency. Walk us through a day in the life of a head brewer. Well first of all, there is nothing glamorous about it. It’s a lot of work! And most of the work happens in non-climate controlled environment. I manage the process grain to glass and all the lab work in between. We have a great guy who does all of our packaging, and helps me with general brewery work and cleaning, which takes a huge load off my plate. Otherwise it is hot, sweaty work here in Florida. I would say the majority of my day is spent cleaning, and monitoring fermentation. The constant learning! And I’m not going to lie, most of the time my learning is synonymous with “oh crap!”, but not always. I’ve worked in other industries where you kind of plateau, but with brewing, there is always new things to learn, or do better, or perfect! And when you’re not brewing? I’m a pretty outdoorsy kind of person. Specifically the water! I’d spend every spare minute I had in one of Florida’s beautiful springs, on the beach, or in my kayak!